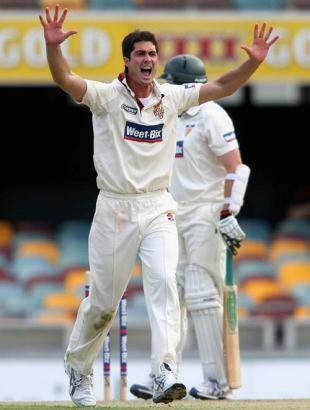 Ben Cutting scythed through Tasmania's tail to deliver Queensland victory by an innings and seven runs within the first hour of the fourth day at the Gabba. Tasmania began the morning at 6 for 209, needing a miracle to avoid defeat, but the speed of their capitulation was surprising all the same. It took the Bulls 45 minutes to pick off the final four wickets and Cutting grabbed three of them to finish with his best first-class figures of 6 for 37. First he had Brett Geeves caught behind for 17, having added one to his overnight total, and then Cutting removed Brady Jones and Brendan Drew for ducks. Chris Swan finished the task when Daniel Marsh was caught behind for 49 and the Tasmania collapse was so sudden that they had only added 10 runs to their overnight score. It meant Queensland did not have to bat again and consigned the Tigers to their second defeat from their opening two matches. Queensland have one win and one draw, having taken first-innings points against Western Australia last month. The Bulls now travel to Adelaide to begin a match with South Australia on Sunday, while Tasmania have a fortnight off before their next game against New South Wales in Sydney.